I doubt many people reading this will have heard of the original Karateka. It’s an old game originally released for the Apple II in 1985, at a time when Choplifter and Pacman represented the cutting edge of gaming. You controlled a tiny man in a karate gi who ran from left to right through a castle. Every so often he’d have to stop and fight a guard using his pro karate skills, and eventually he’d defeat the evil lord of the castle and rescue his kidnapped beloved, a princess. Apparently it was quite good by 1985 standards despite looking tremendously ropey today, but the only reason I’ve heard of it is because it was the first game by Jordan Mechner and basically functioned as a prototype for many of the elements he later implemented in the much better – and better-known – Prince of Persia1. 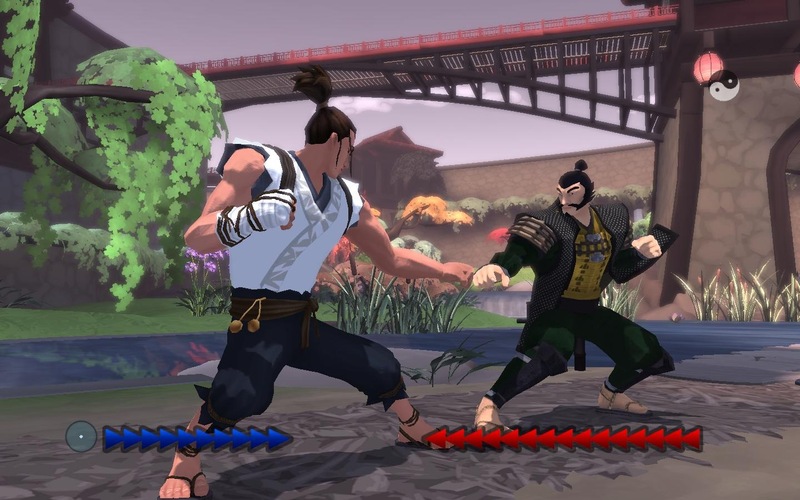 Given that, I find Mechner’s decision to remake Karateka as an XBLA-style arcade game both baffling and intriguing. Is a thirty year-old concept really robust enough to survive an update into the modern age? 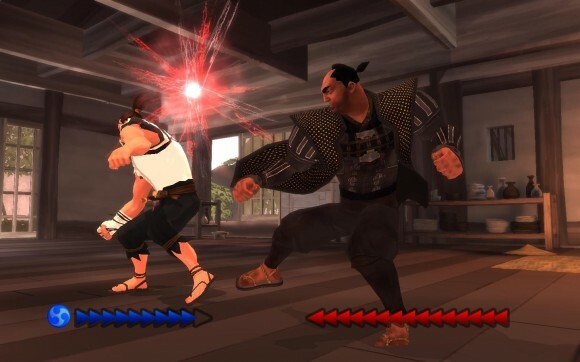 Since I was recently flush with Steam Wallet cash thanks to liquidating my TF2 inventory on the Steam marketplace2 I didn’t feel like spending £7 worth of funbux to see just what Karateka HD was trying to achieve was that much of a risk. A good thing too, since even with my experimental approach I might have felt a bit cheated otherwise. There’s not a great deal to this Karetaka remake, you see. What’s there is good and polished to a reasonable sheen, but it’s a game just as simple as its 1985 forebear. Your fighter can only move in one direction down a linear path. When he meets a baddie they fight, and the combat mechanics of the original have been stripped out in favour of a reflex-based block and riposte system. You can only hit an enemy after you’ve blocked one of his incoming attacks; the window to do so is very small so you need to keep an eye on his hands and feet and time your blocks accordingly. Later enemies have attacks that strike multiple times and you need to block each blow in order to avoid damage, and they’ll also start to camouflage their movements with distracting hand shuffles that throw you off and give you less time to react. There’s the obligatory chi powerup that lets you get in a few free hits on an opponent, flowers scattered along the path that restore your health, and a periodic minigame based around punching an eagle. Your goal, as in the original game, is to reach the end of the path, fight the evil lord and rescue the princess. As game mechanics go these aren’t exactly bad, and fighting baddies is mildly diverting as you try to predict what they’re going to do next. Unfortunately that’s all the game consists of – running down this path and knocking out 25-30 guards and bosses in sequence – and while that might have been good enough for 1985 games have moved on a bit since then, making the core experience of Karetaka HD remarkably flimsy when compared to its contemporaries. A single run through the game will last half an hour at most; you’re supposed to keep replaying it to get a better score and a better time but this gets old very quickly when you face the same enemies in (mostly) the same sequence every single time. In a spectacular piece of design suicide you have to endure the tutorial section every time you play as well, which like all tutorials yanks control away from you and forces you to do things in a manner most unlike the rest of the game. It’s this more than anything else which has turned me off of the idea of replaying Karetaka any more than I already have. That being said, the game does have a few neat touches and one very good idea. Karetaka’s idea is to replace traditional difficulty levels with its Three Suitors system; you start the game as the Princess’s True Love, a hip young man with a mid-sized energy bar and no way to refill it aside from the flowers (and the odd bit of free health from bossfights). Playing as the True Love is Karetaka’s Hard mode, since you’ll need to be very, very good at reading the game to not have him be gradually whittled down by the horde of enemies he has to fight. If the True Love falls he is replaced by the Monk, who has a much larger energy bar and slowly regenerates it on the fly; this makes playing as the Monk a much easier time. And finally if you’re supernaturally incompetent (or are having really bad luck on the end boss) a dead Monk will be replaced by a hulking Brute, who is basically unkillable and hits like a truck3. 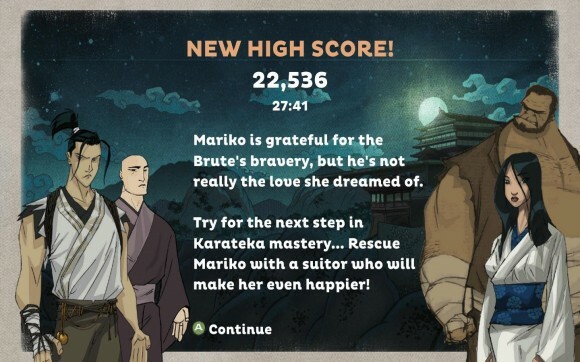 I like games that do innovative things with difficulty and Karetaka most definitely qualifies – you’ll amass more points the further you get in the game as the True Love while the Monk and Brute get smaller bonuses for hitting key milestones, so there is some incentive to get better at the game so that you can nurse the True Love all the way to the end. The game also does change things up slightly depending on who you’re playing as in a given section of the castle, providing some much-needed variety to Karetaka’s otherwise staid routine. Sadly while I’m inclined to cut Karetaka a break on the strength of this difficulty system it’s not enough of a hook to keep me playing. I’ve been through it four times now and it’s barely changed in terms of content on each runthrough, and while I’m good enough to get the True Love all the way to the end boss he shuts me down mercilessly with his seven-strike attacks. I can’t face playing through the same guards again for another 20-25 minutes just to take another crack at him with someone who isn’t the Monk or Brute, and so I’m leaving Karetaka after just two hours of play. I won’t deny that I had fun with it, but in the end that thirty year-old concept just couldn’t cut it in the contemporary world. When they rebooted Prince of Persia4 they added much that turned out to be bloated or superfluous, but the change was necessary in order to make the series work in a modern gaming environment – and remember, the original Prince of Persia was a far more complex game than Karetaka. For all that the goal is a budget XBLA title rather than a triple-A game Karetaka needed the same kind of treatment in order to make it work, a treatment that is far beyond Mechner’s limited resources. As a first project from his new studio it shows promise, but I don’t think it’ll sell well enough to keep them afloat. Maybe he should have made a tower defence game instead.